I read this book in a couple of days due to me being sick and the book being short. Again, I rented this as part of my monthly Prime subscription (I have no affiliation to Amazon). I knew what to expect from reading the last two books, but I always have some need to finish a series – even if I’m aware it won’t be my favourite (sorry Holmberg). So we have the same two main characters, plus for some reason, her sister is introduced in this book. Ceony’s sister, Zina, seemed only to serve one purpose, and that was to plant an idea of a rumour inside Ceony’s head. We also have an enemy of Magician Thane, Magician Bailey. Apparently, he’s held a grudge against Thane for years and has never let go, even though he’s successful. Finally, we have the main ‘enemy’, the Excisioner, who escaped for a transfer somehow and managed to avoid authorities. I believe that the characters in this book are one-dimensional. I can see places where Holmberg has tried to improve the characters and make them more balanced. But overall, the love story between Ceony and Emery Thane is very one-dimensional. Also, the characters that are introduced, like Zina, are added so thinly that the character could very well be removed from the story and nothing would change. I like to try work out one or two topics with every review now. I think it keeps my head in place and lets me think more deeply and reflect on the stories. The first theme in the book is “forbidden love”. Well, maybe love more generally, but the relationship between Ceony and Magician Thane is frowned upon until they are no longer student and teacher. Student-teacher relationships are probably something a lot of girls and guys dream of when they’re younger. I don’t like the fact that Holmberg is practically saying that such a relationship is ok. It’s usually not. Another theme I’d like to touch on is the topic of “what is evil?”. Now, Holmberg touches on this by having the typical “Excisioner is wrong”, all other magic is right. She also touches on the fact that not all Excisioners are bad – such as when Ceony meets the “good” Excisioner that saved her life in the last book. Ceony still has reservations which she says out loud and the “good” Excisioner explains why he’s good. So, I gave this book two stars because there is no half-star rating and I decided that it wasn’t an improvement from the earlier books. I would recommend you only read this book if you get it for free or you have a Prime/book subscription which would let you read it for free. The characters haven’t changed at all over the series and haven’t really “grown up” or learnt anything. 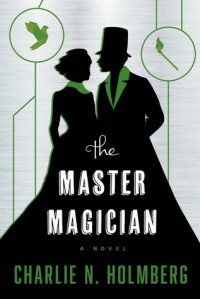 The magical elements of the book are a nice change from other magician books, but not enough to redeem it.